While it was acknowledged that Sybilla Masters [link] had created her invention – Cleansing Curing and Refining of Indian Corn Growing in the Plantations – but according to the laws at the time, women could not own property, not even intellectual property. Therefore, Sybilla’s patent was issued in her husband’s name in 1715. It is to be feared that Dame Sybilla’s invention did not attain to as wide a field of application as was covered by the letters patent. It is more than probable that the obtuse agriculturist continued to shell corn sitting on a pine plank with a spade edge to scrape them off by, in spite of the “paines and industrie” of the dame. Hannah Slater’s invention was for a method of producing sewing thread from cotton. This invention was likely inspired by the mills run by her husband, Samuel Slater, a native of Derbyshire, England. In his youth, Samuel excelled in mathematics and demonstrated exceptional skills as a mechanic. 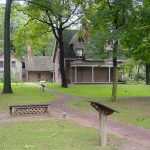 He served an apprenticeship in an English spinning mill and had learned to operate all the machinery involved in converting raw cotton into yarn before coming to America in 1789 when he was 21 years old. 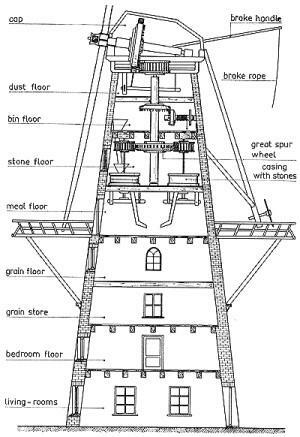 Slater’s principal responsibility was to design and construct duplicate models of the equipment used in British milling establishments. Brown again supplied the capital. 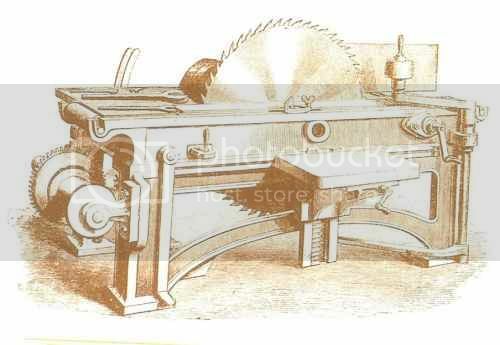 With the aid of a local woodworker, an iron manufacturer, and a general helper, Slater constructed the first practical copies of English carders, water-frame spinners, and looms in the United States. The new mill went into operation in December 1790 and became the first successful water-powered cotton mill in the United States. Slater soon became a partner in the firm. 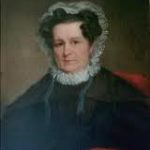 Soon after the mill went into operation, Hannah Wilkinson, daughter of Moses Brown’s business partner, married Samuel Slater. In 1793, only four years after Samuel Slater began his work, Hannah Slater filed for a patent for her method of making cotton sewing thread to the Patent Office created by the Patent Act of 1793. The Patent Act of 1790 opened the door for anyone, male or female, to protect his or her invention with a patent. However, in many states women could not legally own property; therefore, many women did not bother to patent their inventions. 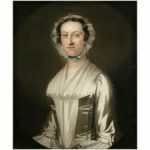 On May 5, 1809, Connecticut native Mary Kies [link] received the first U.S. patent issued to a woman for her method of weaving straw with silk. Using her new method, Kies made and sold beautiful women’s hats. First Lady Dolley Madison [link] publicly thanked Kies for boosting the nation’s hat industry. Straw bonnets manufactured in Massachusetts alone in 1810 had an estimated value of more than $500,000, a tidy sum for the time. New England’s hat industry was one of the few industries that continued to prosper during the War of 1812. Mary Kies was unsuccessful in her attempts to profit from her invention, however. Samples of the straw fabric covered by her patent and woven by Mary Kies are on display at the Wadsworth Athenaeum in Hartford, Connecticut. As with so many inventions, numerous people claimed that they independently invented similar devices around the same period in various parts of the world. Due to her beliefs as a Shaker, she did not patent her design, instead sharing it freely; therefore, it could be used by others. 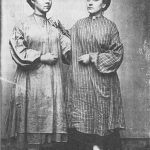 Two Frenchmen patented Babbitt’s invention in the United States three years later when they learned about it in Shaker newspapers. Several factors were likely responsible for the rapid growth in the numbers of women participating in patenting over the period, including their higher labor market participation, greater access to education over time, and legal reforms that improved women’s economic rights. In January of 1884, Judy Reed of Washington DC applied for a patent for her ‘Dough Kneader and Roller,’ an improvement to existing dough kneaders. 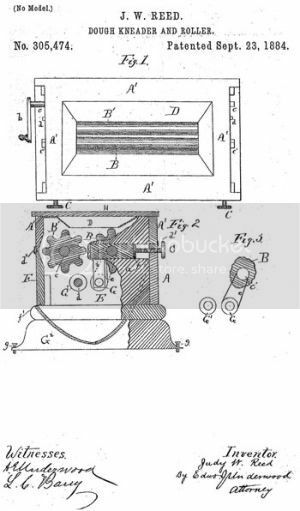 Reed’s device allowed the dough to mix more evenly as it progressed through two intermeshed rollers carved with corrugated slats that would act as kneaders. The dough then passed into a covered receptacle to protect the dough from dust and other particles in the air. It is scarcely thirty years since the first state protected a married woman in the use of her own brain property. Under these conditions, legally incapable of holding property … that woman has not been an inventor to an equal extent with man is not so much a subject of surprise as that she should have invented at all. While every invention, however small, develops new industries, provides work for a multitude of people, increases commercial activity, adds to the revenues of the world, and renders life more desirable, great inventions broaden the boundaries of human thought, bring about social, religious and political changes, hurrying mankind on to a new civilization. … No less is the darkness of the world kept more dense, and its civilization retarded, by all forms of thought, customs of society, or systems of law which prevent the full development and exercise of woman’s inventive powers. By 1840, only twenty more patents had been issued to women, all related to apparel, tools, cookstoves, and fireplaces. From 1855 to 1865, women received an average of 10.1 patents per year while their male counterparts received 3,767.4 patents. During the next decade, 1865 to 1875, the number of patents issued to women increased to 67.3 compared to men’s 11,918.4 patents.